Just because you’re creating content and putting it in front of your ideal client doesn’t mean they’ll consume it. You can have the most valuable content in the world and put it in front of everyone but still have very few actually read it, listen to it, or watch it. Simply creating content and putting it in front of the right people isn’t enough. You need to grab their attention and keep it. 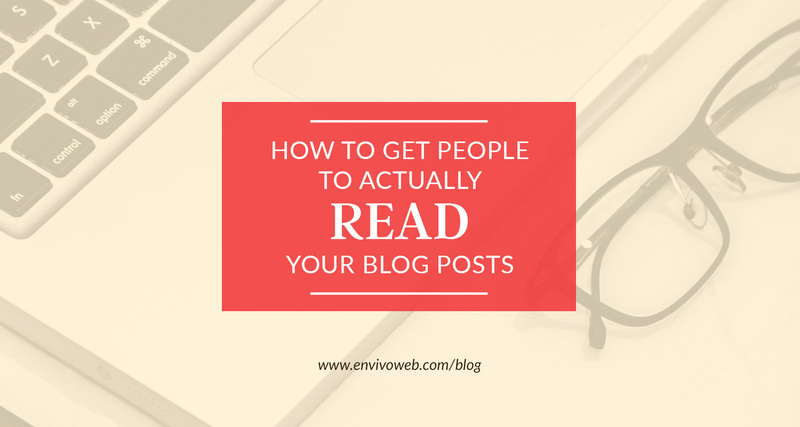 When people land on your blog post, they’ll decide in just a few seconds if this is something they want to stop and read. Here’s how you can help them make the decision to stick around and read everything you have to say. When I say “skimmable”, I mean they should be able to skim the post and be able to get some idea of what the post is about. If you don’t use subheadings, the post would look like an essay. Plus, the reader wouldn’t be able to quickly get the gist of what the post is about. One is to separate different sections of the post. The other way to use subheadings is to emphasize interesting sentences. Envivo’s blog is educational, so I use subheadings to separate different sections of the post. Take this post for example. There are two main points I’m covering. Making your post skimmable and making it readable. I have a few tactics for each, so I use even more subheadings to describe those tactics. Dawn Gluskin, of Blissed Communications, is one of our content management clients. We use subheadings differently for her blog. Her blog posts are more emotional and heartfelt and less “educational” like ours is. The subheadings emphasize important points in her post. They also spark curiosity. 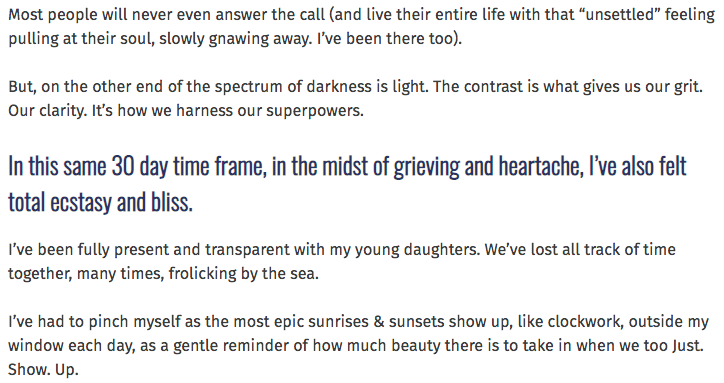 Take this blog post of hers, for example. These subheadings don’t necessarily describe the content immediately below them, like the ones in this blog post do. Hers are highlighting interesting and curiosity-inducing sentences. When the reader is quickly skimming, they may see the second heading and think, “Grieving, heartache, ecstasy, and bliss all at the same time?? How? ?” Now they want to know what happened that made Dawn feel that way. So they’ll scroll to the top and start reading. You’ve likely heard the quote “a picture is worth a thousand words”. When a person is skimming your post, not only do the subheadings give them an overview of the post, but the images will provide additional information. Once they’ve decided the post is worth reading, you need to keep their attention. For many of us, most of the writing we’ve ever done was for school. We had to do tons of research, use fancy words, and be somewhat formal in our writing. A blog is not the place to be “brainy”. I don’t mean to say that you need to water down the quality of your content. Don’t water it down. But write it in a way so that it doesn’t take too much brain power to understand it. Keep your sentences simple, keep your sentences short, and use words that are used conversationally (unless it’s a technical term). Generally speaking, when people are casually surfing the web, they’re not there to use the same amount of brain power they use to read academic content. So if something requires a little more brain power than they care to use, they’ll leave. Plus, people of the internet have short attention spans and there’s a LOT of shiny objects online. It’s really easy to click away. They know they can get what they need elsewhere. Your paragraphs should be short. I usually say use one to four sentences per paragraph. Whenever a paragraph ends, it feels like you’re taking a breath. It keeps the pace of your writing light. Design-wise, when you have short paragraphs, there will be more white space. White space is just empty space. This makes it feel more expansive and less cramped. Speaking of design, your text should be easy to read. Don’t use super tiny font so they have to strain to read it. And also be mindful of the spacing between lines as well (this is called “line-height”). Let your words breeeeeathe. Again, people won’t automatically consume your content just because they’re in front of it. You need to capture their attention and keep it. Take the time to go through a few of your most recent blog posts (or all of them, if you have the time) and make them skimmable and readable! I’d love to see your blog! Post a link to it in the comments below.